The healing power of plants has been known for millennials, and using vegetable gardening as a therapy for certain issues, mental health problems first and foremost is slowly gaining ground across the world. The latest project by Natura Futura Arquitectura is located in Nayón, 15 km from Quito. 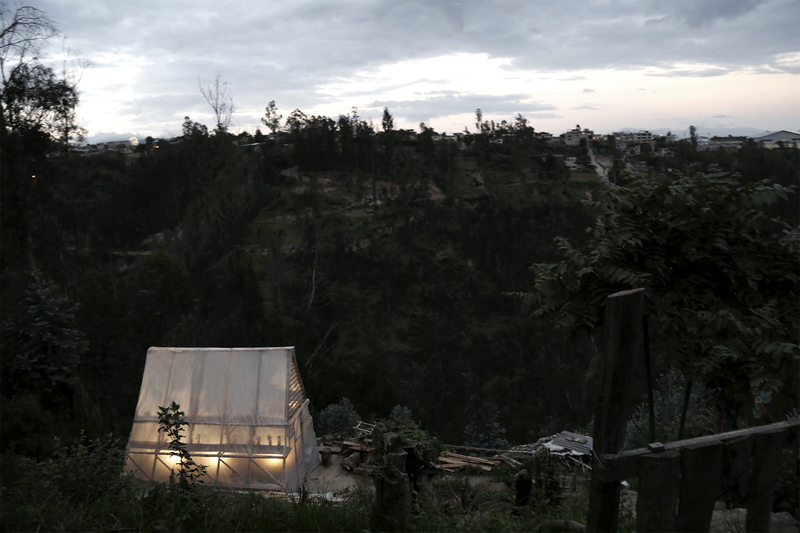 Its subtropical climate is particularly conducive to growing vegetables and flowers, so much so that the roughly 15,000 local residents also call it the “Garden of Quito”. 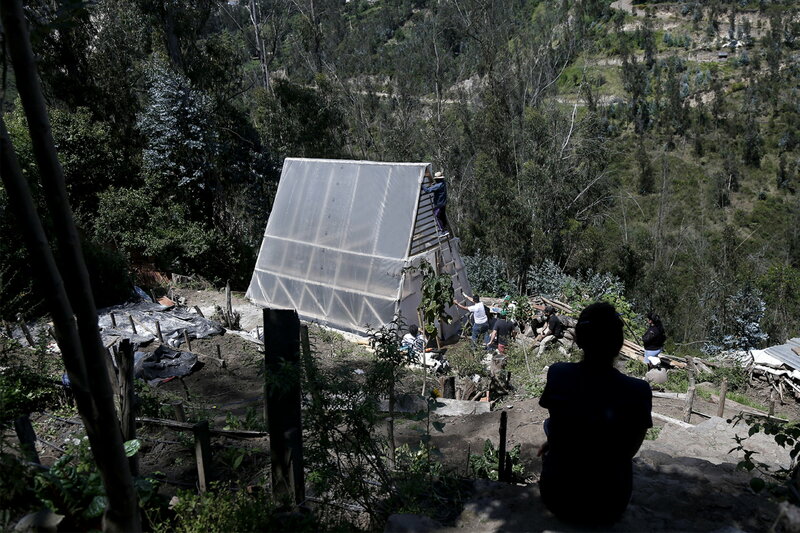 This setting with its lush vegetation is the operations centre of the Huertomanías social cooperative whose members have problems with social interaction due to psychosomatic problems and schizophrenia. Vegetable gardening helps them socialise and at the same time generates an income for them. They now needed a greenhouse on a tight budget to protect young fruit trees from excessive moisture and insects before they are planted in the ground. So the architects from Natura Futura Arquitectura designed a structure using a basic geometric shape - the triangle - as their reference. The cooperative members joined in the building process that used local materials such as bamboo and wood, covered with plastic sheeting, so they also gained skills and learnt how to work with building tools and as part of a team. 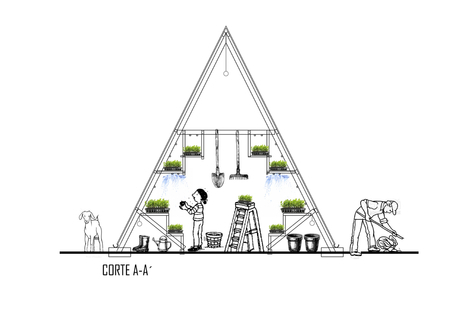 “The Triangle of the Vegetables” is a greenhouse with a simple shape that meets all the needs. A light, semi-transparent structure that blends in harmoniously and with great formal purity in the natural environment, emphasising the social role of architecture as a means of generating independence and giving dignity to people, a mission that is very dear to the hearts of Natura Futura Arquitectura. Contributors: María Fernanda Estrada, Carlos Granizo, Cristian Navas, Freya Cadena, Paula Jaramillo, Aimée Dubois, Sebastián Trujillo, Caros Rojas, Sebastián Medina, Joel Audi, José Gómez, Fausto Quiroz, Omar Hernández, Thalía Montenegro, Vanelly Dumani, Pamela Bravo, Emiliano Trujillo, Marielisa Robles, Eduardo Granizo, Carol Carriel. Roberto Buestan.